Parking on pavements or the kerb (or curb as it is also referred to) is often a grey area for motorists who are unsure if it is acceptable or even illegal. It’s not surprising it can become confusing as parking on pavements is illegal in certain areas, permitted (to a certain extent) in other areas and actively encouraged by the use of parking lines on pavements when motorists have no other option. This section aims to make parking on pavements or kerbs in the UK a little easier to understand not only for motorists, but for pedestrians struggling to use their own streets. Parking on pavement laws are dependent on where you live. Since 1991, parking on pavements has become a decriminalised offence in many parts of the UK and is essentially the councils responsibility, local to your area to enforce the banning of pavement parking. It is a little more confusing for the rest of the country however. Questions often asked are: Are the police responsible for preventing pavement parking in my area? Is it illegal to park on the pavement in my area? Currently as the law stands, it is not illegal to park on pavements in areas that do not have pavement parking restriction signs erected by the local council. This of course excludes areas that are outlined in the Highway Code as being illegal such a double yellow lines or zigzag lines near a pedestrian crossing for example. The Highway Code states that you MUST NOT park partially or wholly on the pavement in London. The definition of ‘must not’ being an absolute prohibition. The Highway Code continues stating that you ‘should not’ do so elsewhere unless signs permit. The definition of ‘should not’ being not recommended. However, this is to a certain extent down to the discretion of the car owner because if they are parked on the pavement and are causing a hazardous obstruction to pedestrians, the car owner could face action. Cars parking on pavements certainly can be hazardous for many pedestrians. In particular, the blind, disabled and individuals with push chairs can struggle to get past an inappropriately parked vehicle. It can also lead pedestrians having to walk into the road to navigate their way around the obstruction. If you are having issues with a persistent pavement parking offender and your street has no pavement parking restrictions, initially contact your local council to establish if they have authority to deal with such offences. The council may request that you provide a letter describing the situation, along with a photo of the vehicle with registration plate whilst parked on the pavement and if possible a name and address of the vehicle owner. The council is likely to write a letter warning the vehicle owner (if applicable) and if the vehicle own persistently obstructs the pavement, further action may be taken. Previously, local councils had to gain special signs authorisation from the Government if they wished to enforce a pavement parking ban on particular streets. 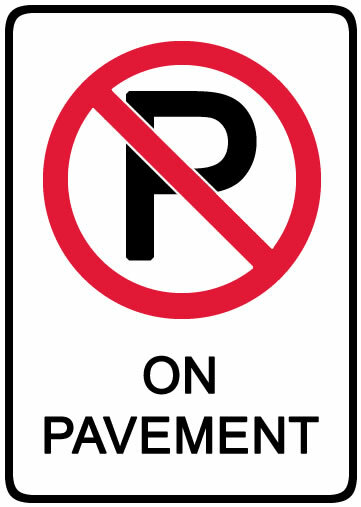 The Government has now given all councils permission to erect signs acknowledging pavement parking bans on particular streets. The Government and councils do recognise that parking on the pavement in certain areas is unavoidable. If there is no off-street parking, or if the road is not wide enough for cars to park both sides without using the pavement, it leaves vehicle owners few options. One may argue that the vehicle owner should park elsewhere. this may however lead to issues of taking up other residents parking areas.